Keep your hand steady and your weapon close because these here streets are about to get real messy. Click here to play! Colt McGee has challenged you to a duel; will you accept? Play Quick Draw today for your chance to take home a huge cash jackpot. This traditional 3-reel slot is played across three pay lines, with the more coins wagered giving you greater payout returns on winning hands. Watch out for Cowboys, Bullets, Guns, and Casino Logos as these are all non-paying symbols. However, if you manage to find yourself spinning up Target Symbols, you could end up earning 45 times your initial line bet. 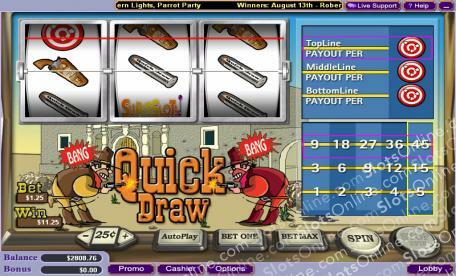 Take up the challenge of Colt McGee and earn yourself the right to be named Quick Draw. Head down to the Quick Draw slots today and walk away with the biggest prize of all: massive cash jackpots!